As part of the California Global Warming Solutions Act of 2006 (AB 32) the ARB has approved an early action measure to reduce high-global warming potential (GWP) greenhouse gas (GHG) emissions (refrigerants and insulating foam blowing agents) from domestic refrigerators, freezers, and air conditioners at end-of-life. This web page is to provide information as the process proceeds in developing the measure to implement this early action. 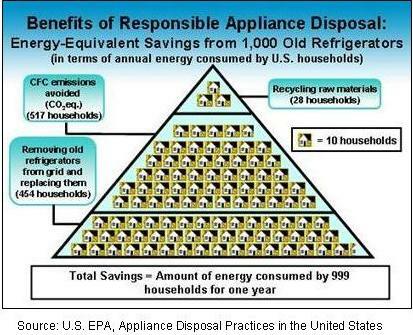 Over one million domestic refrigerators, freezers, and air conditioners (A/Cs) are disposed of in California each year. Pre-1996 appliances contain chlorofluorocarbon (CFC) refrigerants and blowing agents, pre-2002 appliances contain hydrofluorocarbon (HFC) refrigerants and hydrochlorofluorcarbon (HCFC) blowing agents, and post-2003 appliances contain HFC refrigerants and blowing agents. CFCs, HCFCs, and HFCs are all high-GWP GHGs. Older refrigerators, freezers, and A/Cs are much less energy efficient than new, EnergyStar appliances, and replacement of pre-2000 appliances may have significant indirect GHG emissions benefits. Strategy Description: The proposed program could include establishing a voluntary program to encourage the upgrade of pre-2000 residential refrigeration equipment in need of repair, such as refrigerators and freezers to Energy Star efficiences or better. The program could potentially be expanded to include window unit air conditioners (A/Cs). A related strategy, the foam recovery and destruction program, is an effort to recover and destroy high-GWP GHGs from insulating foams. If all waste refrigerant, foam, and other materials are properly recycled/destroyed, direct GHG emissions avoidance benefits may be significant, as well as indirect GHG emissions avoidance due to energy efficiency gains.